Come here. Now, come closer. I want to tell you a story; a story about a talking pig, a pig named Babe. Babe talks to sheeee…what? Well…this is embarrassing! Totally wrong story…oops! Now that I’ve gathered my wits, I do have a story to tell. A story about a gal named Susie and her soup she named Creamy Chicken Soup. Susie had lived her entire life without creating THE soup. THE soup that would top all soups. THE soup that would set the gold standard for all other soups. 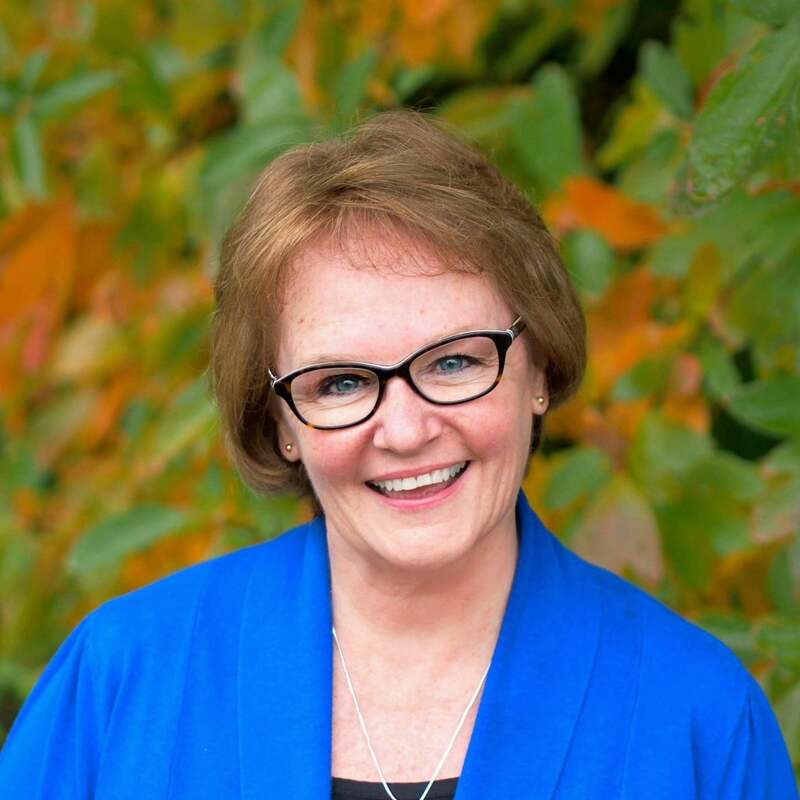 Now, keep in mind Susie wasn’t a braggart, but she knew a great thing when she tasted it, and when she tasted Creamy Chicken Soup, she knew it was THE soup. Just to clarify, I am the Susie in this story, and I am one proud mama to this soup. I tested and retested Creamy Chicken Soup until I decided with one last tweak, she was perfect. That’ll do Creamy Chicken Soup, That’ll do. Please try my other favorite soups: Chicken Noodle Soup, Classic Ham & Bean Soup, Chicken Tortilla Soup and Blue October “Stewed” Beef Stew. 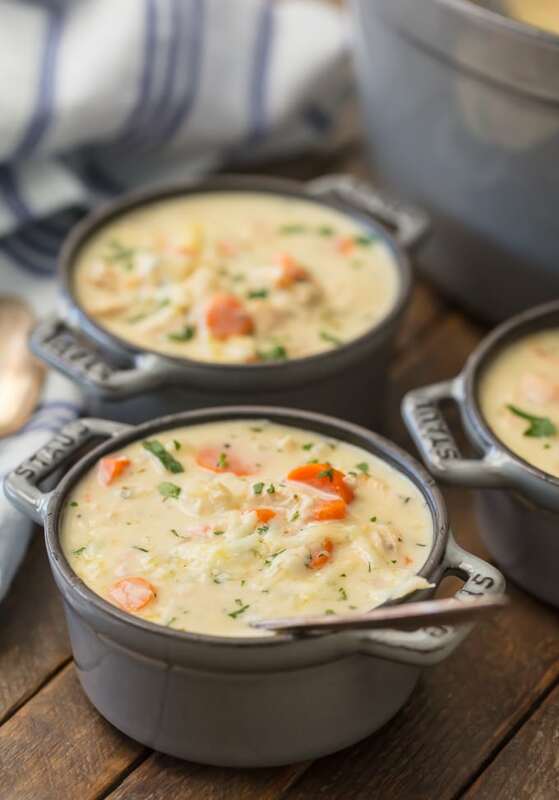 Please head over to The Cookie Rookie to check out some of our other terrific soups: Hash Brown Potato Cheese Soup, Beef Tortilla Soup and Bacon Corn Chowder. To my immense pleasure, I’m certain we will post more of our favorite soups in the future. 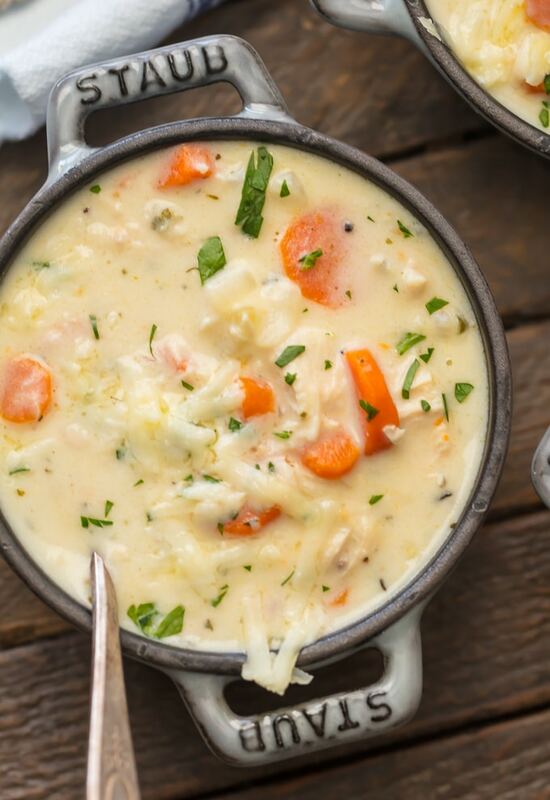 Creamy Chicken Soup. Tender chicken, aromatic vegetables and herbs, cream, a splash of wine topped with a touch of nutty Gruyere. The ultimate comfort food. 4-5 cups cooked chicken cubed or shredded – rotisserie chicken works well, but do NOT use smoked chicken. Heat 2 tablespoons oil and 2 tablespoons butter in a medium saucepan then sprinkle the flour on top. Whisk quickly until well combined. Cook, whisking occasionally, until the roux turns light golden brown. Slowly, while whisking, add 1-cup chicken broth to the roux and whisk vigorously until smooth. Remove the roux from the heat and set it aside while combining other ingredients. In a large Dutch oven, heat 2 tablespoons butter and 2 tablespoons oil over MED-HIGH heat. Add the carrots and celery, sauté 5 minutes; stir occasionally. Add the diced onions and cook 3 additional minutes or until the onions are translucent. Add the minced garlic and cook 30 seconds – just long enough for the garlic to bloom. Slowly add 1 cup of broth while scraping the bottom of the pot to deglaze the pan. Add the rest of the broth and the wine, the roux and stir well. Bring the mixture to a boil and stir often..
Reduce the heat to LOW and add all other ingredients except the garnishes. Simmer 15 minutes then taste and adjust seasonings, if necessary. This is the time to add salt or pepper, if desired. Continue to simmer the soup until it thickens, about 30-45 minutes more, or to the desired consistency. Garnish with sprinklings of shredded Gruyere and fresh parsley. Serve with crusty bread. Mmm-Mmm GREAT! Note: Creamy Chicken Soup is delicious served over baked potatoes. *Note: A variation: Potatoes are delicious added to this soup. I like to bake or steam a couple of Yukon Gold potatoes until tender, chop them into 1” cubes and add to the soup right before serving. ***Note: If the soup doesn’t thicken to your liking, add 2 tablespoons cornstarch to ¼ cup cold milk/cream, stir and add it to the soup. Bring to a boil and cook 5 minutes, stir often. Reduce heat to LOW and simmer until desired thickness. 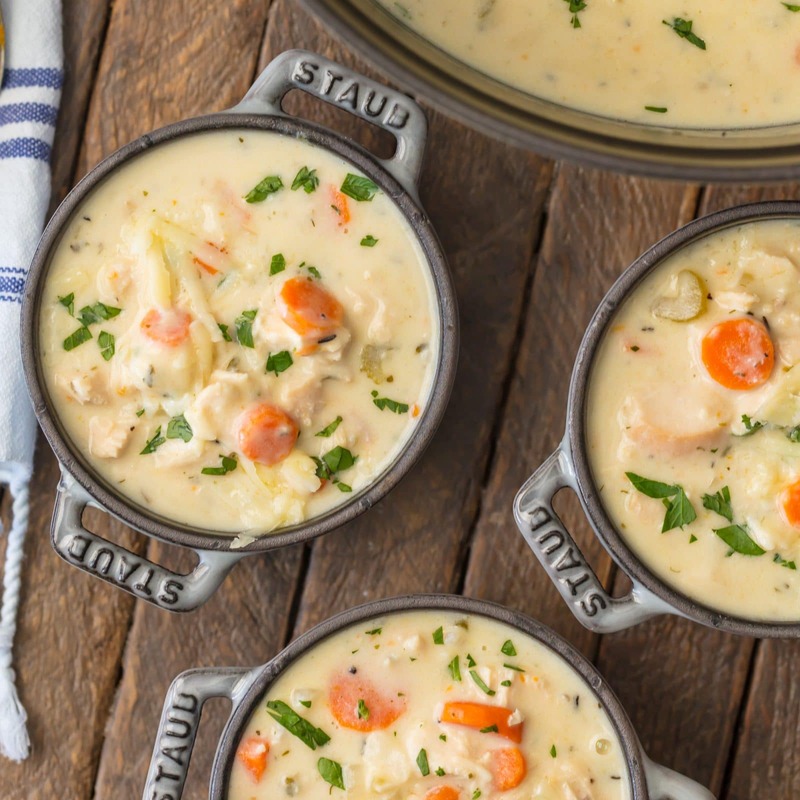 ****Creamy Chicken Soup freezes well. It will keep up to 3 months. Be sure NO potatoes are added before freezing. This looks and sounds amazing! Just one question when do you add the roux back in? Will be making very soon. Hello Patty and thank you for visiting Simply Sated. Also, thanks for finding my error in the recipe. The roux is added right after adding the bulk of the chicken broth. I have corrected the recipe to indicate where to add the roux. Thanks again and please let me know if you find other errors. I truly appreciate it. I was using the other recipe that was on the cookie rookie website. It had tumeric in it and this recipe doesn't. It doesn't taste the same or small the same as the other one. The other recipe was so good I made it 3 times in 1 week and told so many people about. Is there somewhere to find the original one. Thank you for your comment Sylvia. I did, accidentally, omit the turmeric, but have added it back to the recipe. This is my original recipe, and I had listed 1/2 turmeric (as an option) in the original because many people don't keep it in their pantry. I think it is a great addition, also. I hope you enjoy, and thanks again for pointing out my omission. This is the best chicken soup! I have five kids ranging from ages 22 down to 12, plus my husband. They request that I make it often - very often. And when they invite guests over, they want me to make this. Thank you so much for this fabulous gem! 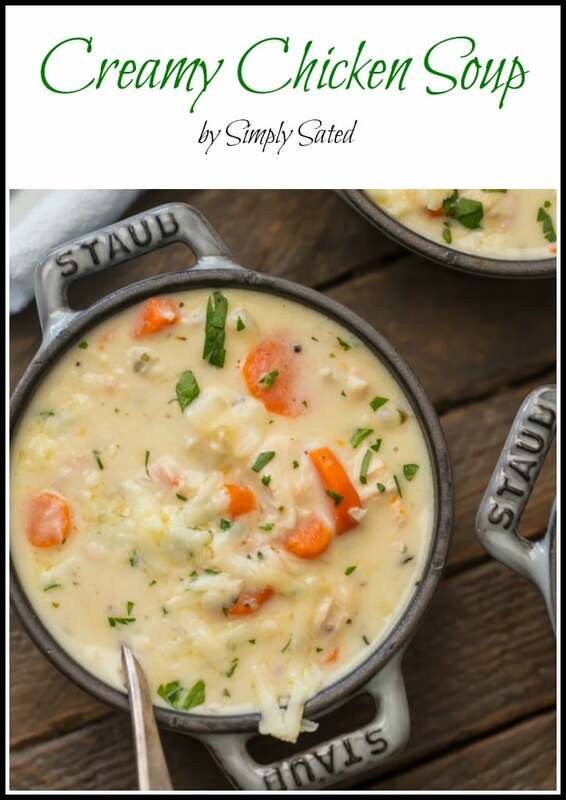 I have been making this soup since I found it on The Cookie Rookie, it is by far my most favorite chicken soup! The flavors are incredible! Am I crazy or did the recipe once call for tumeric?? Hello Mona, You are correct, the original recipe did include 1/2 teaspoon turmeric which I had listed as optional. I have added it back to the recipe since it so many like the addition. Thank you for pointing out my omission. I appreciate it and hope this helps. Enjoy! Yummy! Looks so good! This recipe definitely is my pick for ultimate comfort food. Thank you for fixing. I also have made the original recipe from The cookie Rookie several times and have shared The recipe as well. Best darn soup ever! I do believe The making of the roux changed as well. I don't recall adding in broth to the roux, just added the roux in at the end with everything else. Thanks for this amazing soup my whole family loves time after time. This soup is ridiculously good. I made it twice within a two week span....and ate it every day at work. The second time I made some wild rice (cooked in chicken broth)....added it to the soup. A wonderful addition. Thank you for this! Best soup ever. I’ve made it over 6 times in the last month for different people and it always gets the same response!😍 thank u sooo much for sharing! I absolutely love this soup. And I rarely, if ever, say that about recipes from blogs or other internet sites that I visit. I am very picky- my mother and her mother before her trained at a french cooking school so I do know what good food is. And this is it! I made the recipe as written with left-over baked chicken that I had made 2 nights before. I did not have herbs de provence and used fresh thyme and rosemary as a substitute. I do try to watch calories and I used 2% milk with 1/2 cup half-n-half. Served with french baguette and white wine- yummy. I will absolutely make this again. And again. And again! I've been making this soup for a few years now and I, along with everyone I've made this for, love it. It's the best soup I've ever tasted. Oh my goodness, Kristyn, thank you! I really appreciate you letting me know. Have a great evening and please visit Simply Sated again. Ive been makiNg this for a whils but have been having lactose Intolerance lately. What kind of dairy free milk would you suggest in this recipe? Thanks! Hello Cherie, I need to say I'm not anywhere knowledgeable about being lactose intolerant. With that said, I did a quick google search and Soy milk comes highly rated in substitutions for cow's milk when making soup. I haven't tested my recipe with soy milk, so I can't it is a great substitution. I'm sorry, I just don't know (for certain) without testing the recipe. If you do, please let me know your results. I would truly appreciate any input. Thanks so much. Easy and delicious, with some variation. I read the reveiws first before trying it and almost did not make it, so glad I did. There were a few reveiws that said it had not taste. so untrue, this is a keeper. I did not have 1½ teaspoon Herbs de Provence so I add the spices that are in there. At the end I add a few noodles. Very tasty will make it again and again thank for recipe. This was insanely delicious, Yukon Gold are my 'go-to' potatoes, and I served them cooked & diced in a separate bowl, so that whomever wanted to add them to their soup could do so. It took a bit longer than 15 min.to prep the mizenplas, but once that was done, the rest went pretty quickly. This was a lovely & comforting dish, on a cold snowy day. Thank you so much, Fiona, it was very sweet to comment, and I'm so glad you enjoyed it. It's my favorite soup, too. I do not keep bouLlion/chicken base in my house. Is there a substitute for it or can it be omitted? Is there a fresher option? Hello Eleni, I'm not sure, but I suppose you could use an additional cup of chicken broth with added salt. The bouillon cubes/base are very salty, so just add enough kosher salt or even seasoned salt, to taste. Thanks for stopping by and please let me know how your soup turns out. I loVe soup, however I have not tried This recipe yet. Besides Tumeric, i see that paprika and red pepper flakes are Also optional ingredIents. Do you use thEse ingredIentS in this Recipe? Everything makes a differencE in the outcomE of the finished product. Does this question make sense? Hello Rose, Your question is a good one. I use all the ingredients listed in the recipe (almost) each time I make it. I don't always add turmeric, but others have said they miss it when left out. Not everyone likes a little 'heat' in their soup, but I do, so I added red pepper flakes although sparingly. I love the smoky nuance the Smoky Paprika adds, but I still consider it optional. I 'tweak' every recipe I create almost each time I make it and find it's a fun way to experiment with flavors, seasonings and spices. Thanks for asking and thanks for stopping by Simply Sated. Hi Susie! Frank from the Netherlands here. I made your soup today and it is gorgeous. Truly delicious and very well balanced. your tweaking paid off girl! keep it up and thanks for sharing! I have not made the soup yet but was curious as to why you state to not use smoked chicken? Hey Susan, The reason I say not to use smoked chicken is because I did use it once thinking it would add a nice touch. The soup was just okay, but not nearly as good as usual. I think it is due to too many flavors fighting for the lead - especially when there are already so many flavors going on. Smoky chicken actually made the soup not as tasty. Thanks for the question and thanks for stopping by Simply Sated. I hope you make the soup - it is delicious. Its a keeper! 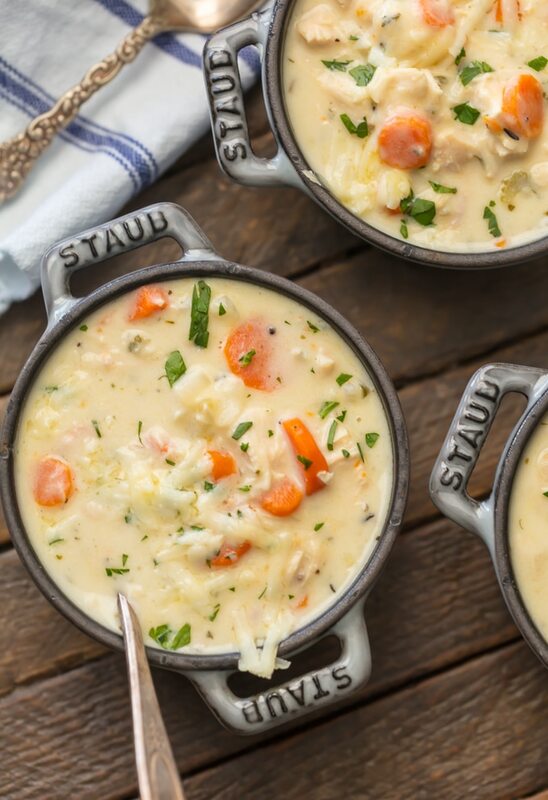 My family absolutley loved this soup! We used rotisserie chicken and fOllowed the recipe, we wouldnt change a thing. Next time we will make double. Thank you! Thank you Mrs. Fox for taking the time to tell me you love this soup. Your comment is so nice and I really appreciate you letting me know. 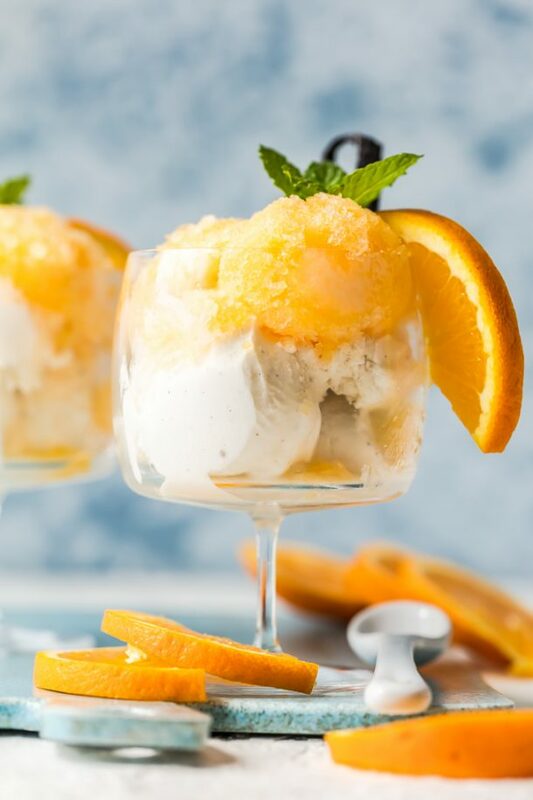 i'be been making this recipe for years even in the heat of summer i crave it!. It is so very delicious.I have to double it every time to make enough to last past one night! My only change is to add egg noodles at the end. Hello Caroline and thanks for letting me know how much you have enjoyed this soup. It is my favorite. I often serve leftovers over baked potatoes or cut up baked potatoes (or steam baby potatoes) to add to the soup. It is extra-hearty then:-) Have a great day and thanks again for letting me know. Where does the white wine come in? Excited to try your soup! Delicious! I will definitely be making again.of course, had to use mostly cream ;)I know it will be a hit with our guests this afternoon and I have enough to freeze another meal. Just tried your recipe tonight and it was wonderful, I made it with my Instant pot. a keeper for sure! I'm so glad - thanks for letting me know. Nothing's better than soup in this cold weather. Thank you for sharing the recipe. 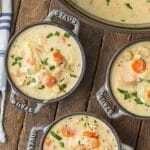 YoUr creamy chicken soup recipe is divine! I made it tOday and serving it st our Christmas Dinner! If there is any left! So yummy! Thank you, Barb, I really appreciate you taking the time to comment. I'm so glad you liked it. I made your cream of Chicken soup. it is OUTSTANDING! this is a new family fav. Thank you! PS i'm telling all my FRIENDS about it too. Hello Candy, Please let me know what you think. I'm pretty sure you will love it, but if not, that's okay. Thanks for letting me know. 5 stars! We are MAKING this again and we WOULD not CHANGE a thing. It was a major hit with our family. FIrst time making This recipe and it is beyond delicious 🤗. definiTely will be making this again. My Grandpa sure does this recipe lol. What type of did you use in this recipe? Was it olive oil, vegetabke oiL? Thank yOu!